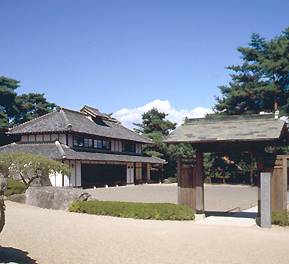 The Kurita Museum Ashikaga Hall was opened in 1975. (Asikaga School). In this elegant and historical town, I selected a picturesque place for the site, on an area of nearly 24 acres , and built the Museum Hall surrounded by a landscaped garden, constructed without destroying the natural beauty. Since the opening of the Museum , the devotees of pottery and porcelain who have visited from many countries , have evaluated and appreciated it as a museum of marked individuality and the essence of real art. A great feature of the Museum is that it is the first to exhibit only pottery and porcelain produced in Japan. The Museum only exhibits Imari and Nabeshima wares. Imari ware was collected by not only nobles , warriors ,wealthy merchants and common people in Japan in the Edo period ( A.D.1603-1867 ) , but also by people in Asia and Europe. Nabeshima ware are products made in the kilns founded by the Prince Nabashima. All these wares have been collected by myself and displayed in stands designed by myself. In other words , it can be said that the Museum as a whole is a symbol of my love of the Imari and Nabeshima wares. been able to overcome the many difficulties I encountered. Thus , the collections have been gradually increased and become abundant enough to let the people fully enjoy the art of the Imari and Nabeshima wares. I am very proud of the Museum in which all the eternally beautiful masterpieces are exhibited. I will be very pleased if the Museum , which is founded upon my passionate enthusiasm , should be useuful to lovers of pottery and porcelain , should contribute to their understanding of a keen appreciation of the art and of the peaceful mind of the Japanese people who created such articles, and should deepen their affection for the Imari and Nabeshima wares. Mondays, (the day following national holidays) 28 Dec. to 2 Jan.
TOBU Line : Take the TOBU Isesaki-line,and get off at Ashikaga‐shi station. Then take a taxi (about 15 minutes from the station). 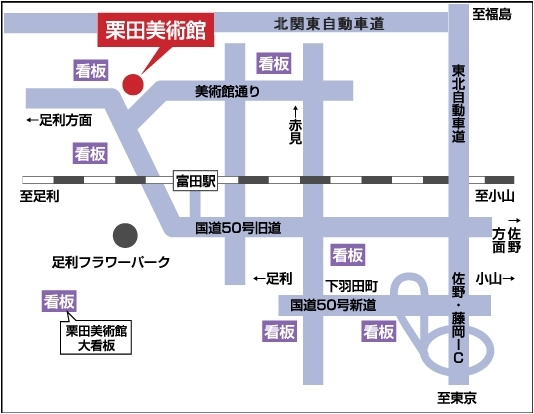 JR Line : Take the JR Ryomo-line, and get off at Tomita station. Copyright(C)Kurita Museum All Rights Reserved.